No shampoo for me anymore! I first wrote this page after not having shampooed my hair for an entire year ... no shampoo, no conditioner, no hair styling products - absolutely no commercial hair care products had touched my hair in an entire year. .... it has now been well over 8 years and I am still doing this and loving it!!! And my hair is healthier and more manageable than it has ever been in my life! Well it has been long known to me the unhealthy, dangerous and toxic ingredients that are contained within all those pretty bottles of shampoo and conditioners on the store shelves. I tried 'natural' and 'healthy' brands of shampoo and conditioner but still found dubious items in their ingredient lists that I really didn't want on my head. I tried making my own shampoo and conditioner using completely natural ingredients but I was never happy with how they worked or felt. Then I stepped back and remembered my philosophy of 'just keeping it simple'. Life is always at its easiest and most enjoyable when things are simple and uncomplicated. Enter Apple Cider Vinegar, Baking Soda and Water. Those 3 things are the only things that have touched my hair and scalp in the first year of doing this (and I actually did away with the baking soda very quickly and just used apple cider vinegar and water). Some people refer to this as the 'no poo' method .. i.e. no shampoo. I hadn't heard of this term when I had my epiphany to wash my hair naturally but since I have been doing this I have come to realize that there are many others out there also doing this and there is actually a (growing) phrase to describe this called the 'no poo' method. Note that there are no bubbles or foam when you do this. You may be accustomed to always having bubbly foam when you clean your hair but remember that foam is not necessary for clean hair. And the ingredients that are typically used to cause most shampoos to foam are very unhealthy. Baking soda, apple cider vinegar and water are extremely good cleansers. No shampoo is needed. 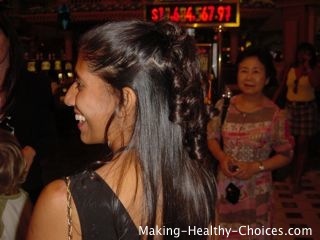 Commercial shampoos can dry your scalp leading to dandruff and itchy scalp. Apple cider vinegar is actually a very effective dandruff remedy and preventative against dandruff. I simply started by mixing baking soda with water (about 1 tbsp shaken into about 8oz of water). This I use to wash my hair and I do so by simply pouring the baking soda / water mixture over my wet hair in the shower and massaging my hair and scalp with my fingertips (after a few week a omitted this step of using baking soda and shifted to only using apple cider vinegar and water). Then I do the same thing with 1-2 tbsp of apple cider vinegar mixed into 8 oz of water. This serves as a nice finishing rinse. Then rinse well and you're done! Basically the water and my fingertips do most of the work. No need for fancy (and unhealthy) chemicals. Use your fingertips to massage your scalp really well. This massage brings circulation to your scalp which will do the most to nourish your hair and keep it shiny and manageable. After a couple of weeks I stopped using the baking soda / water mixture. From then on I would just wash with water and rinse with the diluted apple cider vinegar .. and sometimes I would just use water alone. So simple and so easy!! The longer answer is that you need to have patience and persistence to let your hair adjust and detox. It isn't always easy to go through this part but if you can persevere the rewards are so great! What Does it Mean to Let Your Hair Adjust and Detox? Well, if you are like most people, your hair has had years and years of daily bombardment of shampoos, conditioners, hair styling products, etc. It takes time for the residues of all these nasty chemicals to leave.... this is the detoxing part. The adjusting part means that it will take your hair, scalp and hair follicles time to re-adjust back to their normal state. For so long things have been clogged up and covered up with chemicals and other unnatural ingredients. As these unnatural ingredients are removed, your hair and scalp will slowly begin to create its normal amount of healthy oils. This will take time. Your hair will go from being very dry to very oily to very frizzy to very heavy (and everything in between) while the norm is being reached. It is here where you really need to be committed to what you are doing. It will pass!! For me it took a good 2 months before my scalp and hair re-adjusted to its norm. During those 2 months there were many days of really awful looking and awful feeling hair but I persevered and after about 2 months my hair looked and felt better than ever and has been that way ever since. Will This Work for Everybody, Every Hair Type? I can only share with you my experience. I have heard of many others having benefits doing this and it is my feeling that everyone can benefit if enough patience and commitment is engaged. I also strongly believe that eating right, exercising and other healthy lifestyle choices all play a role in the health of your hair. Have you tried? Share your experiences in the comments section below. -I have long wavy dark hair. -I was never able to manage my hair without a ton of conditioner in it every single time I showered. -Without a ton of conditioner my hair used to be full of really big tangles. -I was never able to wear my hair down as it would always fall limp into my face and the fly away ends would annoy me as they tickled my face. And this no shampoo method works wonderfully for me. What Do I Love About No Shampoo Hair Care? I no longer feel dependent on store bought concoctions to wash / condition my hair. I save SO MUCH money not buying any of those store bought concoctions. When travelling, I have nothing to pack (well maybe a small bottle of apple cider vinegar). I rest easy knowing that I am putting no damaging chemicals on my scalp, so close to my brain. I love knowing that I am not contributing to polluting the water system (every single thing you use in your shower runs down the drain and enters our collective water system). I love that I can now wear my hair down if I choose and my hair feels great day after day. I love the soft and silky feel of my hair. I love the manageability and shine that my hair now has. I love that this is so simple, healthy and natural. I strongly encourage you to give this no shampoo or 'no poo' method a try.